You can consider Mount Washington officially three for three. 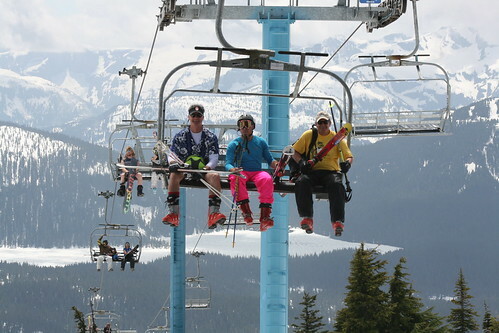 2012 marks the third consecutive year that the mountain resort is open for skiing and snowboarding on Father’s Day. A Father’s Day opening comes as no surprise to resort staff. “We recently completed another stellar snow season up here so the writing was on the wall back in April- we were contemplating another summer snow session,” explains resort spokesperson Brent Curtain. Mount Washington will be running its Whiskey Jack chair on June 16th and 17th and has confirmed that Linton’s Loop (one of my personal favourites) will be open from top to bottom. The mountain may announce further openings closer to those dates. Tickets are a bargain at only $25 for each plus $25 for rentals, if necessary. You’ll save an extra 10% if you buy your tickets and book online. If that’s not enough, all Father’s Day skiers and boarders will receive a two-for-one Mile High Chairlift Ride voucher. There will also be prizes handed out throughout the weekend for best outfits and costumes. For more information on the Father’s Day weekend at Mount Washington, check out all of the details on Mount Washington’s website. The resort is located above the Comox Valley at 1 Strathcona Parkway. To find out about accommodation and package information, call Mount Washington Alpine Resort at 1-888-231-1499 toll free or locally at 250-338-1386. That is pretty cool. Skiing up until Father’s day eh? Wonder what the snow is like. The mountain was even open on Canada Day last year!